For each tax rule delete and edit actions are available. 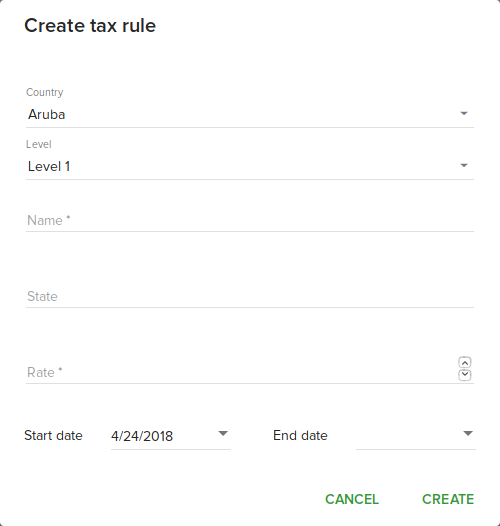 Clicking the create button will allow you to create a new tax rule. After clicking a create dialog will be displayed. Level - The level field allows you to select tax level. When applying taxes first all Level 1 taxes will be applied then all Level 2 taxes will be applied to the amount resulted after applying Level 1 taxes. 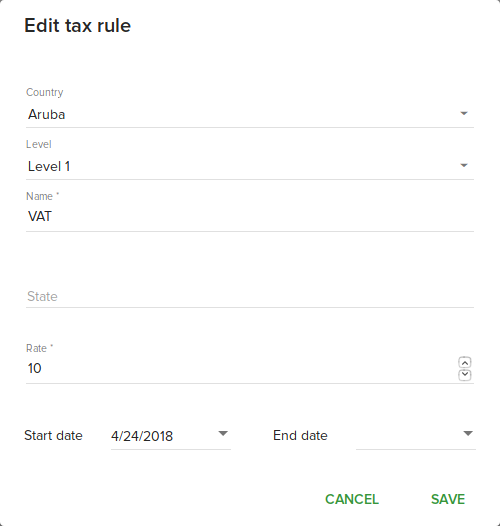 Complete all needed fields then click Create in order to create a new tax rule. Click delete button near the tax rule to delete the rule. A confirmation dialog will be displayed. Click Delete tax rule to delete the rule. Clicking the edit button will allow you to edit a tax rule. Complete all fields you want to change then click Save in order to save changes to the tax rule.